As luck would have it, I have a cycling friend in St Etienne (today's Paris-Nice finish). Philippe kindly invited me to come see the stage with him after first exploring the very interesting hills of the Parc Naturel Régional du Pilat by bike. 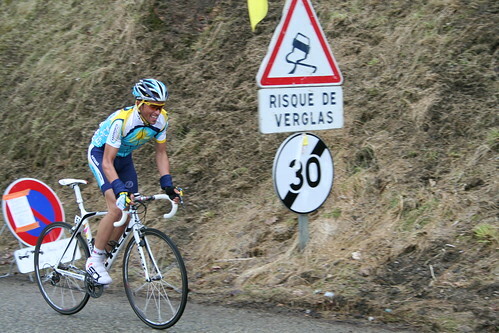 Above: Contador was just flying (photo by Philippe). 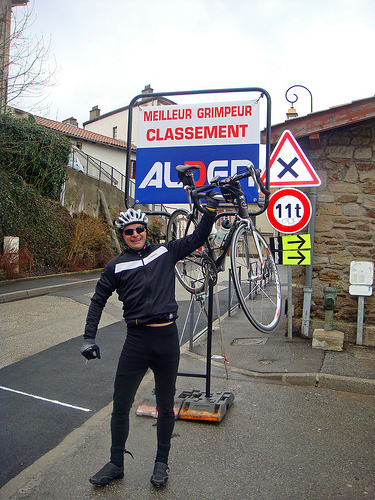 As luck would have it, I have a cycling friend that lives in Saint Etienne (today’s Paris-Nice finish). Philippe had kindly invited me to come see stage four of the Paris-Nice race after first exploring on bike the very interesting hills of the Parc Naturel Régional du Pilat. The plan? 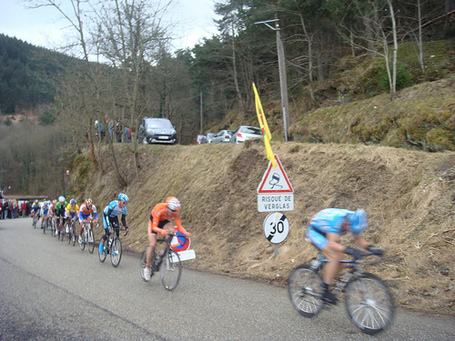 We parked at the top of the last climb of the Paris-Nice stage – about 6 kms from the finish in Rochetaillée – and went for a pre-race ride up high knowing we could change into dry/warm clothes to watch the race. Philippe knows I am a “chasseur des cols” (mountain pass hunter) and thus he had designed a route to show me some of the famous climbs in the area (map at bottom). Prudence being the better part of valour, we skipped the Col de la Republique. A future project? 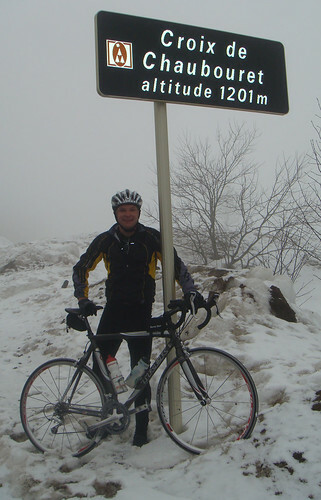 But we successfully climbed Croix de Chabouret and Col de l’Oeillon. Perhaps June or July would have been a better month for our ride. 🙂 But fun! The location was beautiful. Exactly at the the top of the last climb were the well preserved ruins of the 12th century Chateau de Rochetaillée. It wasn’t too crowded but there were a couple of hundred people – mainly French – but of course several Belgium (Flemish) camper vans. When we heard the helicopter signaling the approach of the riders, the official car came by and announced that Vandevelde had a 1′ 45″ second lead. Sorry, I had a cheap camera because of the weather and some focus problems so sadly all my shots were fuzzy especially when cropped. And then to everyone’s surprise we saw Contador only 15 or so seconds behind – and he was FLYING! It was truly exciting to hear the surprised shouts of everyone suddenly recognizing him. He looked like he was smiling (photo at beginning), but I assume it was a grimace. 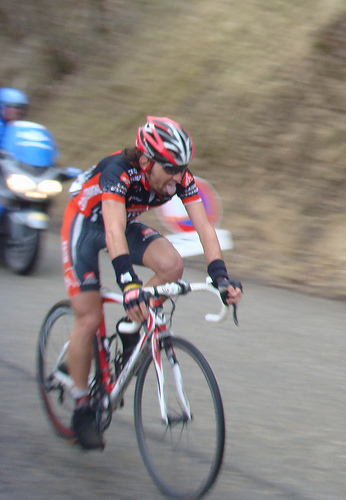 He is truly majestic when attacking a climb! As always les pompiers (firemen) were out in full force. There was a group in hot pursuit. And everyone was searching for French hero and race leader Sylvain Chavanel – and a big roar when he finally appeared not too far behind. 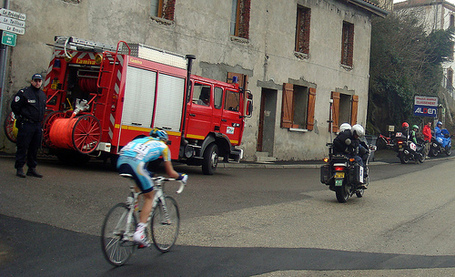 Riders were all over the road and it took a long time for everyone to pass – some people were definitely suffering. 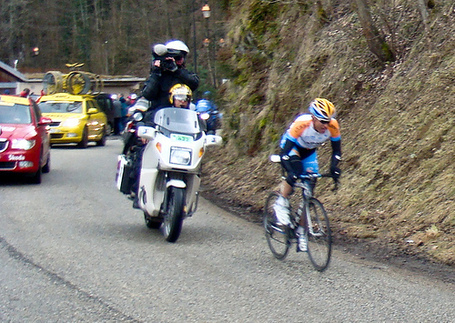 Note to Barry: Cadel Evans – stranded on his own – looked ready to lay down and die when he slowly passed us. I must say that the final descent must have been a thrill to watch. A wet, occasionally steep, small road. I couldn’t imagine trying to race down it. These guys are amazing. Vous avez été au sommet de l’Oeillon, ou du Crêt de la Botte ? 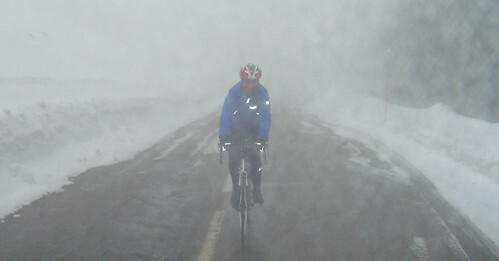 Will, it was a pleasure and I hope you’ll come back next summer for more “Massif Central” cols ! There are so many beautiful rides (Pierre sur Haute, etc ;-). yes please, i certainly hope to visit for another Col hunting tour. We had a lot of fun and Philippe was an excellent host – it must difficult politely listening to me speak french for several hours!! ;).